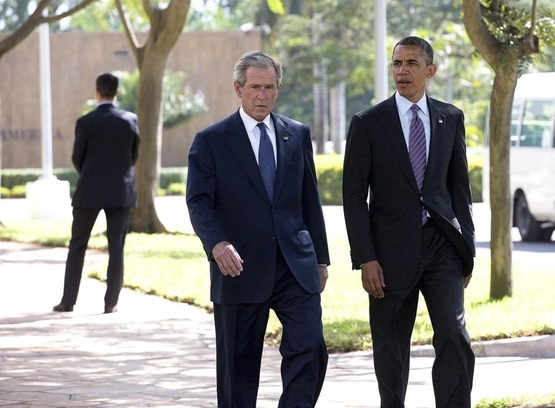 Former President George W. Bush has refrained from publicly criticizing his successor, President Obama. IN THE MONTHS and years ahead, tens of millions of Americans will have strong feelings about Donald Trump's presidency, and most won't hesitate to express their views. One American who should is Barack Obama. As he reverts to a private citizen come Jan. 20, Obama will have the same right as any American to speak his mind in public. Yet it's a right he should refrain from exercising when it comes to his successor. In the modern era, most former presidents have taken pains not to openly criticize or second-guess those who succeed them in office. That reticence is commendable. David Axelrod, the chief strategist for Obama's presidential campaigns and a senior adviser during the president's first term, speaks glowingly of the way George W. Bush treated the man who followed him in the Oval Office. Not only was Bush "very gracious to us during the transition," Axelrod told The New York Times a few months ago, but he "has been unfailingly gracious and respectful since." In fact, Axelrod quotes Obama as saying that Bush had "taught him lessons in how to be a former president." Since the election, however, Obama has suggested that he may not take those lessons to heart. "I want to be respectful of the office and give the president-elect an opportunity to put forward his platform and his arguments without somebody popping off in every instance," Obama said at a press conference on Nov. 19. But immediately he added: "As an American citizen who cares deeply about our country, if there are issues that have less to do with the specifics of some legislative proposal or battle, but go to core questions about our values and our ideals, and if I think that it's necessary or helpful for me to defend those ideals, then I'll examine it when it comes." Obama's words were understood as a signal that he may not shy away from publicly criticizing Trump — a signal reinforced by his comments to the liberal activist group Organizing for Action about returning to the political fray once he leaves the White House. "You're going to see me early next year," he promised. "We're going to be in a position where we can start cooking up all kinds of great stuff to do." Obama will be sorely, and understandably, tempted to push back if Trump moves to unwind achievements that Obama considers integral to his legacy — the Iran nuclear deal, the Affordable Care Act, non-deportation of illegal immigrant "dreamers." He would be wise to resist that temptation and hold his tongue, just as Bush did when Obama routinely condemned his record and worked vigorously to overturn it. Bush steadfastly refused to critique Obama's performance, even when prodded by reporters to do so. 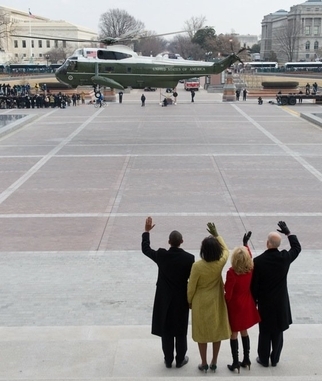 President Obama — shown on Inauguration Day 2009 waving farewell (along with his wife, Michelle, and Vice President Joe Biden and his wife, Jill) as the helicopter carrying George W. Bush departs from the U.S. Capitol — can look forward to many years as a former president. "I don't think it does any good," he said in a 2013 interview. "It's a hard job. He's got plenty on his agenda. It's difficult. A former president doesn't need to make it any harder." Repeatedly, Bush has stressed that it's bad for the country "to have a former president undermine a current president." Ex-presidents of both parties have agreed. After leaving the White House, Lyndon Johnson didn't trash Richard Nixon; Gerald Ford didn't publicly undercut Jimmy Carter; George H.W. Bush was unfailingly respectful of Bill Clinton; and Clinton didn't exploit his popularity to snipe at Bush 43. The only real exception has been Jimmy Carter, who has blasted his successors on numerous occasions, with little effect except to cement his reputation as a self-righteous nag. In our angry and polarized culture, former presidents do more good when they don't pour partisan fuel on political fires. Trump, like every president, will face a chorus of opposition. Critics will be legion, with or without Obama. Far rarer will be voices of reconciliation and moderation — especially voices reflecting the rare experience of having been chief executive. As a former POTUS, Obama will have ready access to Trump. Nothing will impede him from communicating his concerns and rebukes in private conversation (which is where they are likeliest to have the greatest impact). In public, however, Obama ought to follow his predecessor's example: Be a model of gracious respect, and let others fling the brickbats.